The C100 Classic Series Public Address Amplifier 100W from Bogen is a reliable mixer/amplifier. This amp uses discreet complementary transistor circuitry for reliable power at each output stage. The rear panel has variable output taps at 4/8/16 ohms and 25/70V. This amp has 4 inputs with independent volume controls plus treble and bass controls. Output jacks are provided for recording or secondary amplifiers. 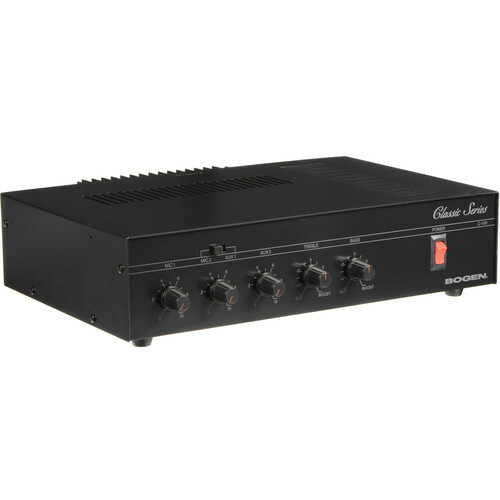 Box Dimensions (LxWxH) 18.6 x 14.4 x 7.6"
C100 Classic Series Public Address Amplifier 100W is rated 4.6 out of 5 by 5. Rated 5 out of 5 by N1ROA from Fast-simple-accurate Fast shipping, easy to install and replaced the same one thwt had been inservice at a fire station for 8 years and never turned off. Rated 5 out of 5 by Jim Smith from RELIABLE We have used Bogen amplifiers at all our sites. They have always been reliable and dependable for our paging systems. I would recommend Bogen to any business. Easy setup and clear sounding. Rated 5 out of 5 by William from Great product In expanding our sound system, I purchased this amplifier as a replacement for the same model which has operated for over 20 years.